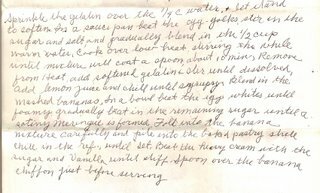 "after breaking 12 or 13 eggs--I would mix a little of the yolk in with the whites--thereby preventing the 'whites' to attain the desired 'whipped' stage"
. 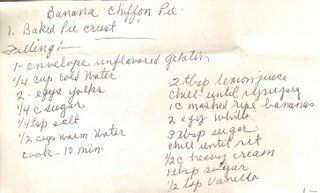 . . "Browsing thru my boxes of cook-books, I came across a "Banana Chiffon Pie"--I'm going to tackle it in a day or two--substituting 'Pumpkin' for the Banana--and use 1-1/2 envelopes gelatin instead of the (1) envelope that it calls for."